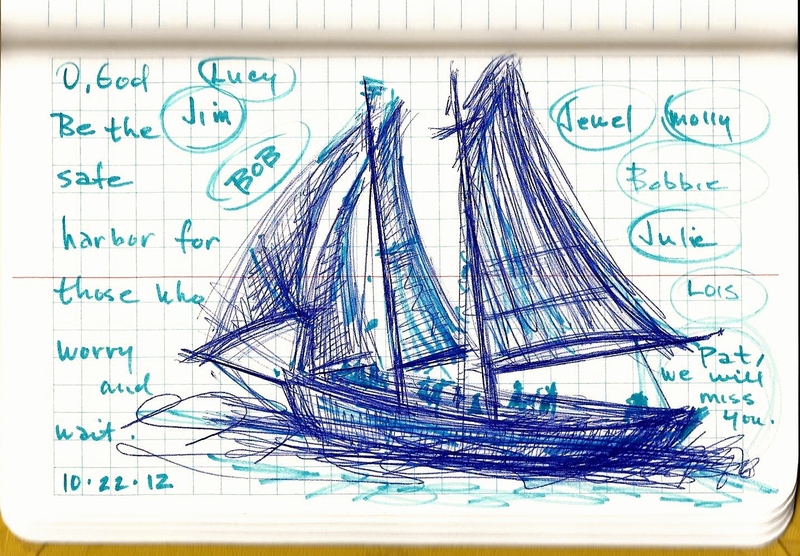 Harbor – Any place of shelter or refuge. Tomorrow our family will celebrate the life of one family member while another will have heart surgery. 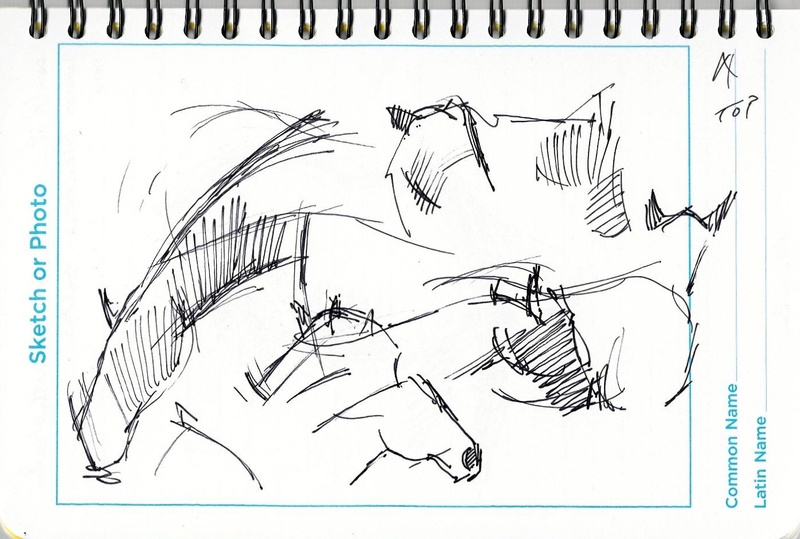 One afternoon in June, my friend and I went to the stables at Glendorn to sketch horses. The horses moved every few seconds to keep the bugs off; at least they looked uncomfortable to me–swishing their tails, shaking their heads, shifting their great weight from side to side, trading positions every few minutes. They appeared ‘antsy’, but maybe it was just me. Highs and Lows: My low today was being a poor listener; I felt ‘antsy’. I interupted a colleague a few too many times and talked more than was helpful. My high came near the end of the day, while listening to a friend share some awesome stories of when she was growing up. When did you hear God’s awesome melody today? A tiny drop of fear can water the imagination. When I moved to the Quad Cities six years ago, someone with the best of intentions warned me not to go walking alone at Blackhawk State Park. A young woman’s remains had once been found there. 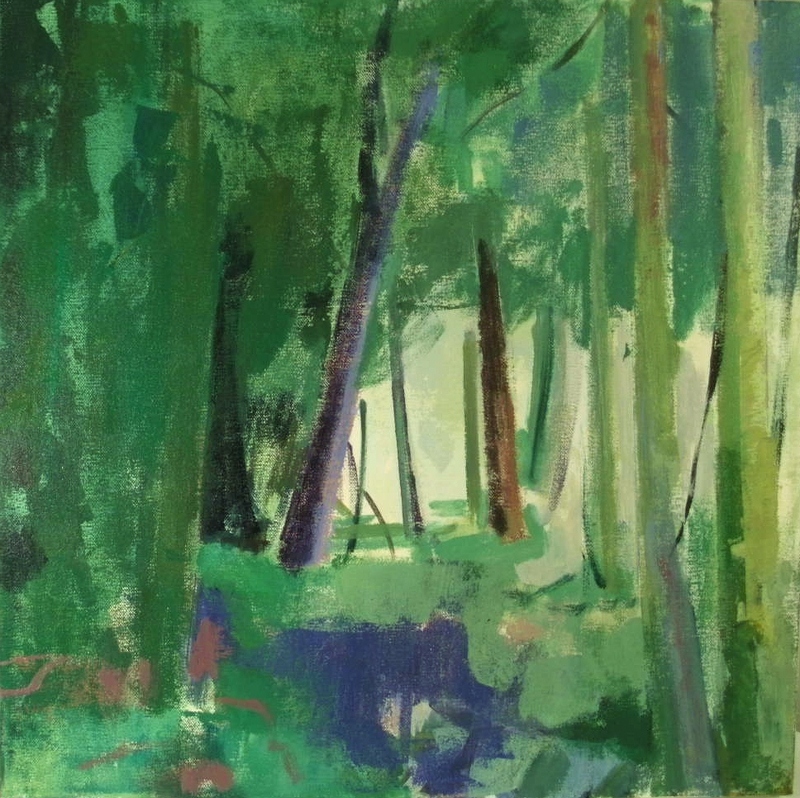 The advice stuck in my mind and for six years I avoided walking the woodland trails. Last Sunday afternoon, I had the best time walking the pathes at Blackhawk State Park. 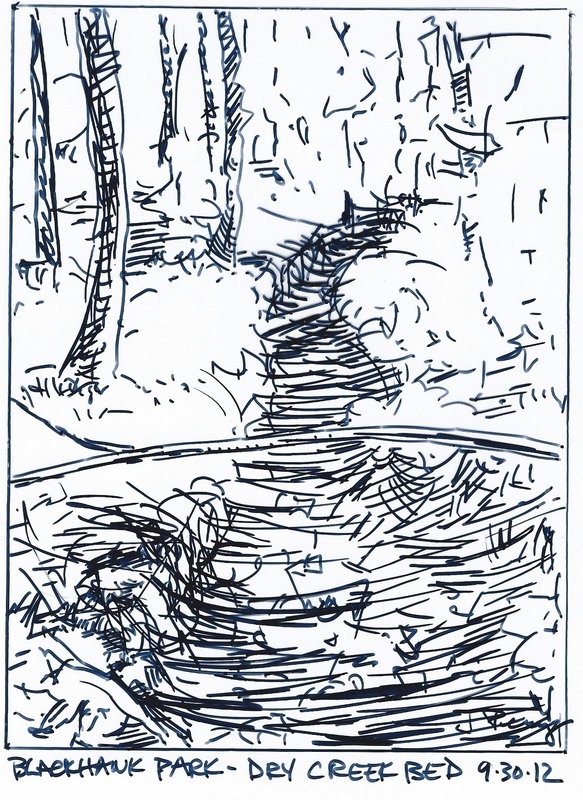 At times, the trails, made dusty from use, wrapped tightly along dry creek beds and steep ledges. The late afternoon sun filtered through golden leaves. 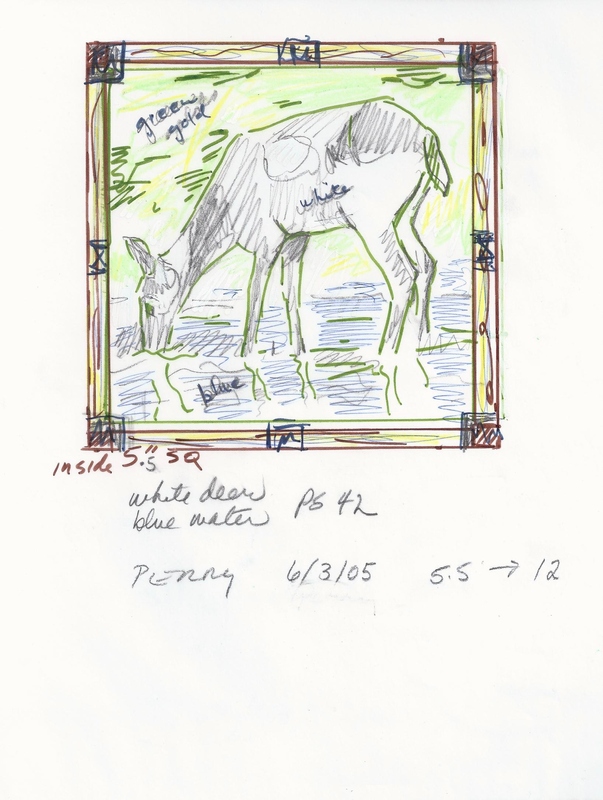 Along the way, I met several generations laughing and enjoying the woods. The deep dry creek beds were the most interesting to me, full of rocks and leaves and not a drop of fear. 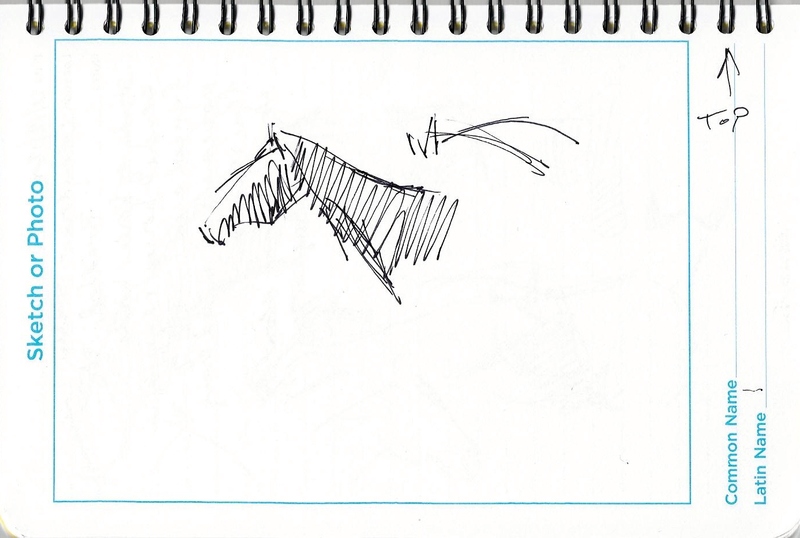 This week, I came across two drawings that I did while in seminary. My schedule was pretty screwed up back then. More times than I care to admit, I would set my alarm for 3:00 a.m. in order to complete an assignment. There was little time for art, but I wanted to do it. 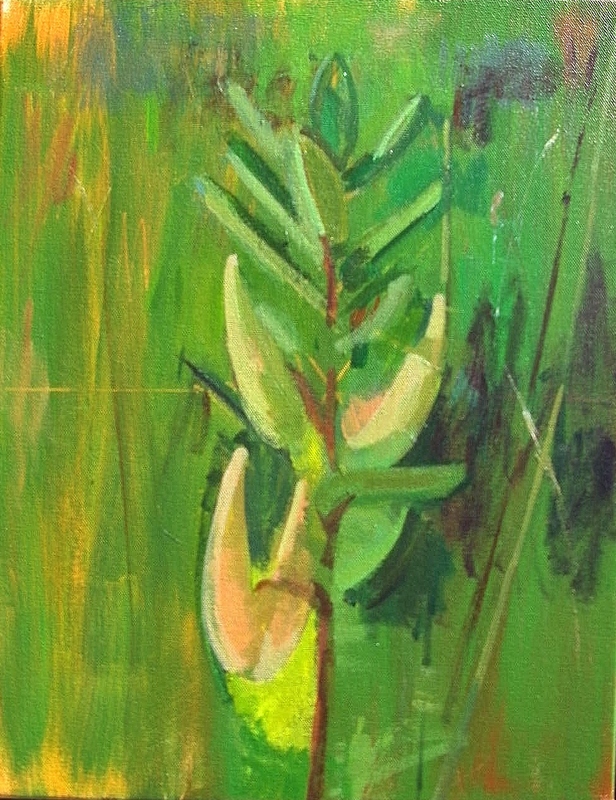 To get back into the practice of art, a friend suggested to me that I might start by just holding some art supply in my hand and present that to God. At the time, I had been cutting small paper squares and putting them in a glass canning jar for use later to create some small mosaic something. It was comforting to sit before God during prayer time, just holding that glass jar, without words. My holding the half empty jar said it all. 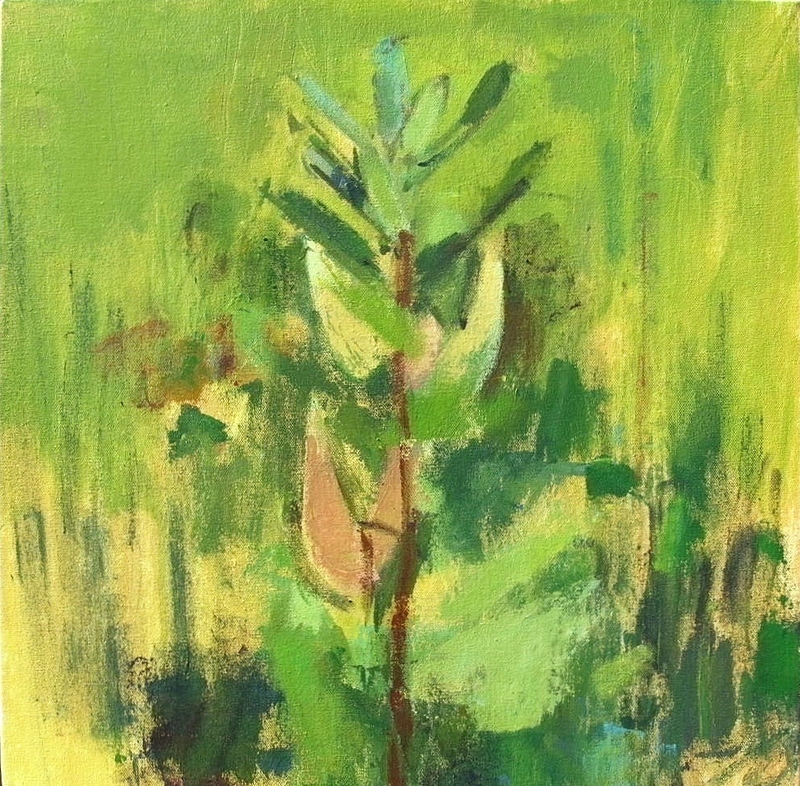 I plan to make prints of these two studies and will post my process. Prayer: Thank you, God, for quenching our thirst for you in amazing ways. ‘My daughter. She studied eco-biology and now works for the park service and studies grouse’. 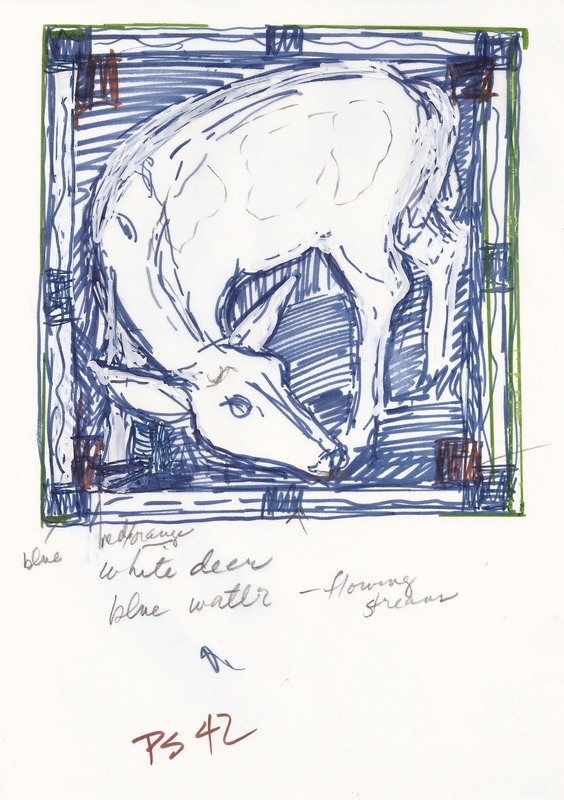 “Anna Feeding a Doe” by Jacqueline Perry (5th trial proof). 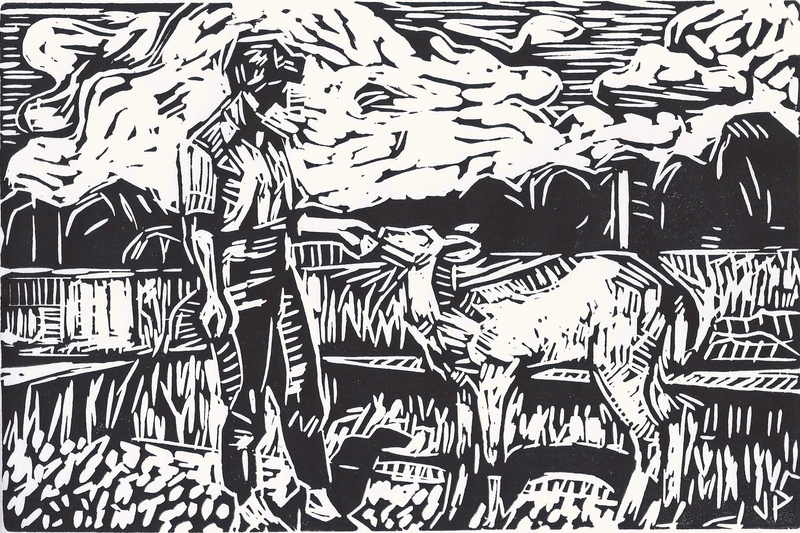 Linocut on rice paper. 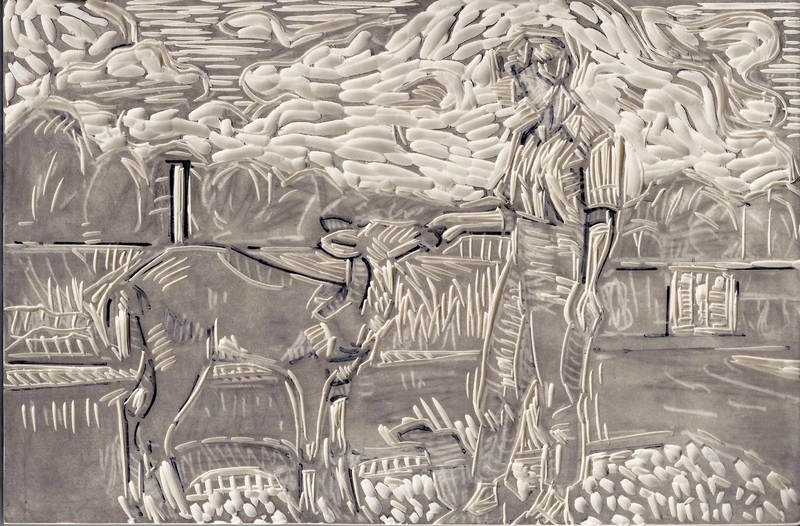 The ‘plate’ is softer than linoleum and easy to cut. 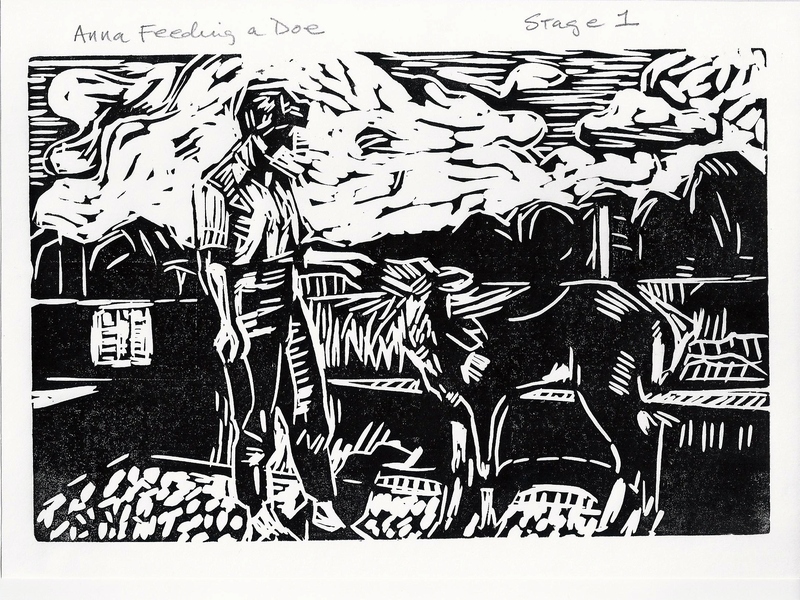 “Anna Feeding a Doe” by Jacqueline Perry, first trial proof. 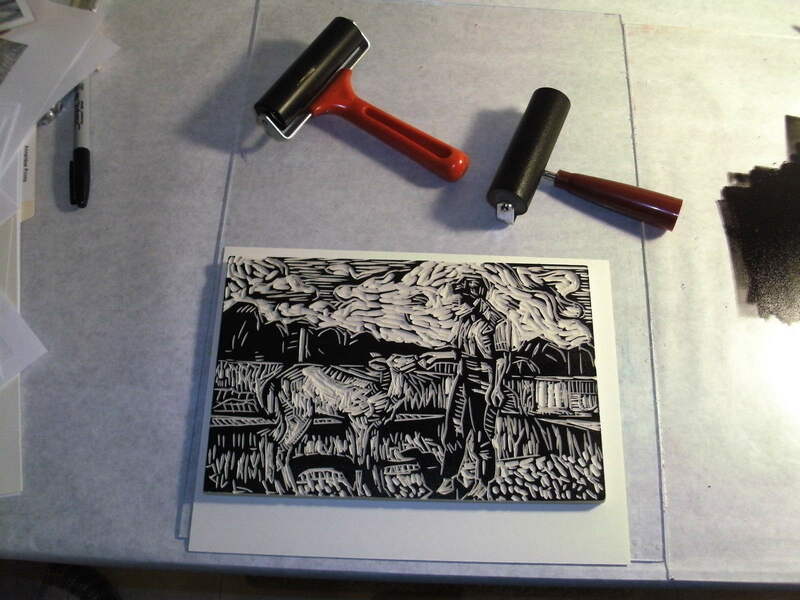 Printmaking can be tedious. There are many steps, but it is so darned satisfying to lift the paper off of the plate to see the final outcome. The print is a surprise each time. I can pull twenty prints in a row, and experience twenty surprises. This amazes me. Prayer: Thank you, God, for dull steps that lead me to something more. 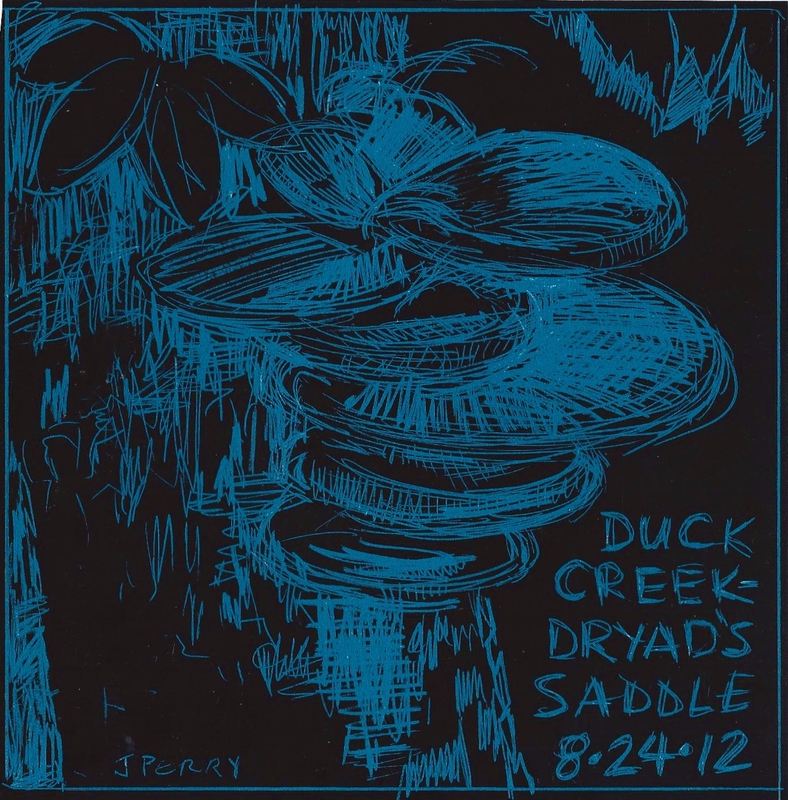 “Duck Creek-Dryad’s Saddle 8.24.12″ by Jacqueline Perry, scratch-art paper 6″x6”. Dryad’s Saddle enters a living tree trunk through a wound in the tree. The fungus is a creamy color with small brown spots. Large pancake-shaped funnels stack up in beautiful layers. I spotted this one at Duck Creek Park this morning…a small surpise. Last week, we had many good cloud days. On the prairie, its so easy to notice the sky. 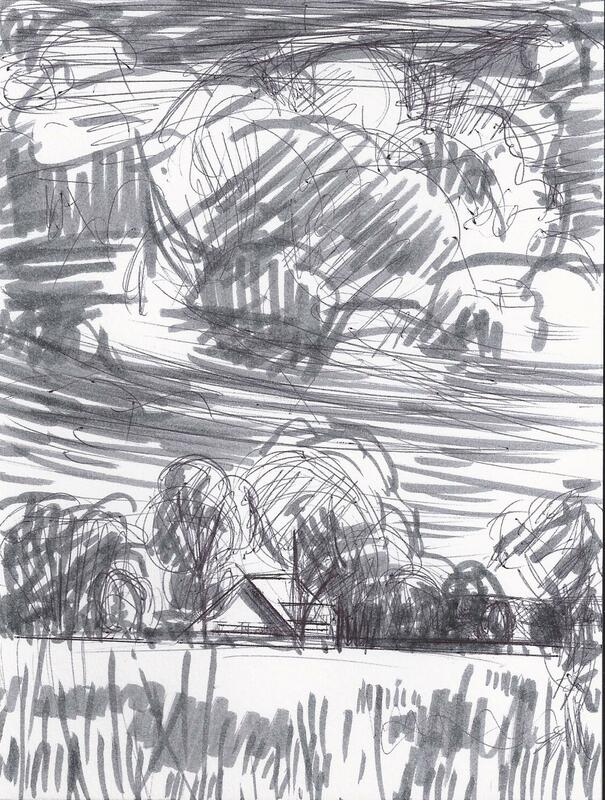 One day, facing the front of a simple red barn, I giggled because there were two simple matching puffy clouds on either side of the red barn. It looked like those pictures that little kids draw. My french easle set up at Our Lady of the Prairie Retreat Center near Big Rock, Iowa. 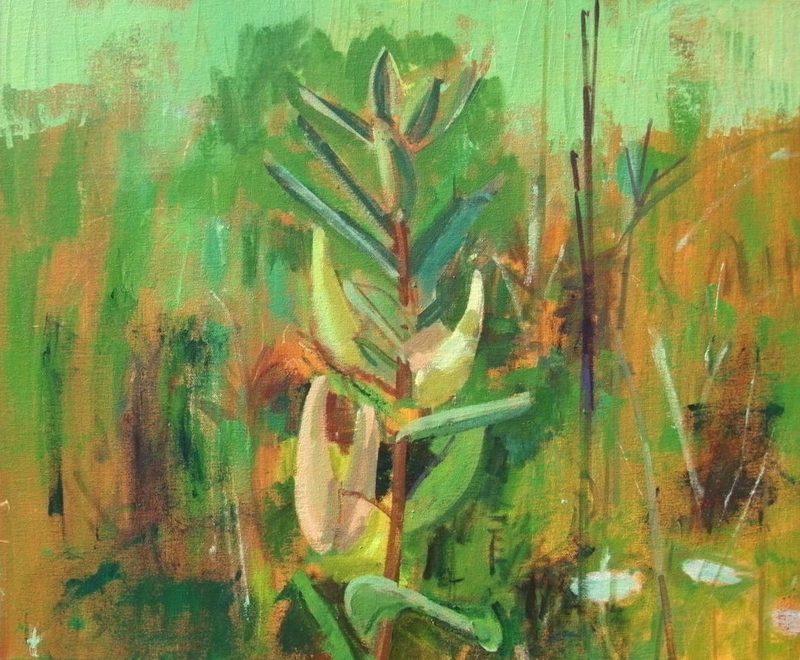 This is the first state for “Prairie Milkweed Morning”. Thank you to Kathleen and Kathy and Our Lady of the Prairie Retreat Center (info at: http://www.chmiowa.org/catering_to_the_soul.cfm ) for your amazing hospitality these past five days. Thank you for your prairie bread, and homemade wild plum jam this morning! What a perfect place to spend my last week of summer sabbatical. 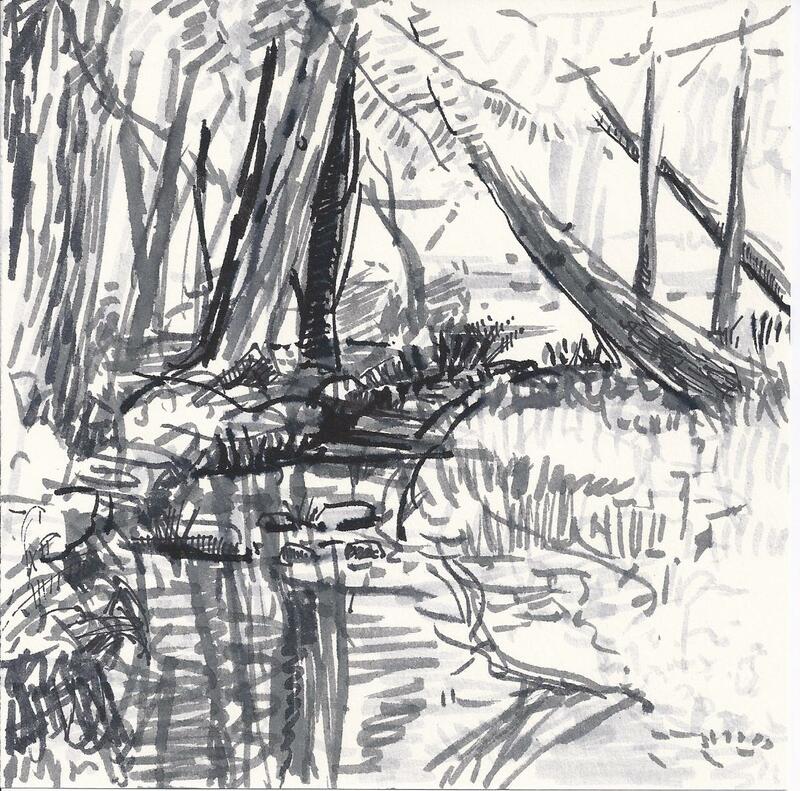 I began my time away in a soft muddy slough; I end the time surrounded by dry prairie grass. God’s creation is beautifully complex…and good. 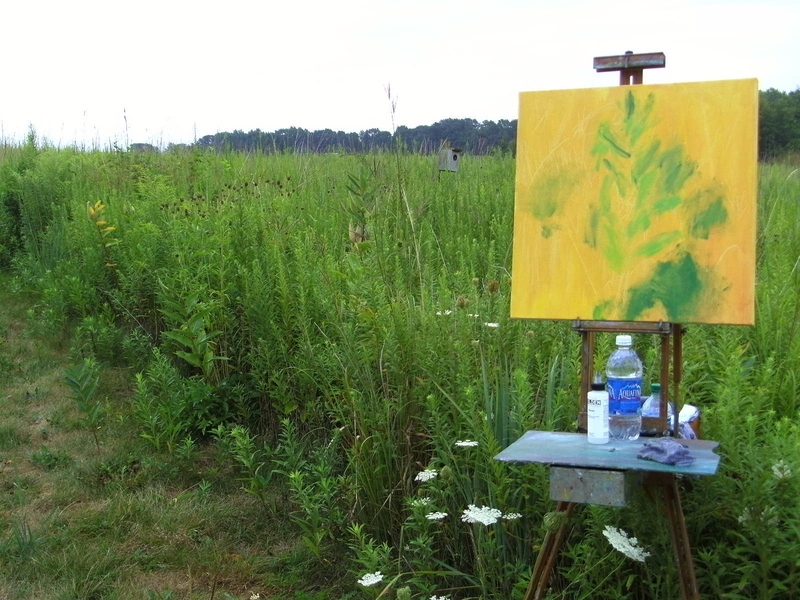 My art project this week was to find the quiet center in the midst of complexity. Surely, I can apply these lessons to my ministry.